When a quiz appears simply open the quiz, you will be shown the Quiz Summary before you take the quiz informing you how long the quiz will be, if there is a pass mark required and the number of attempts you will be given. When you are ready simply tap to start the quiz. Once you complete a quiz it will no longer appear in your Quizzes tab. You can review your quiz history by tapping Results at the bottom of the screen. Here you can select a completed quiz, review your submitted answers and if there are multiple attempts, retake the quiz. There are a number of different quiz types you may be asked to complete. Some quizzes will appear in a 'chat format' and seem more conversational in their nature, while others will appear as questions, one after the other. Not all questions will be multiple choice. So pay close attention to the questions. 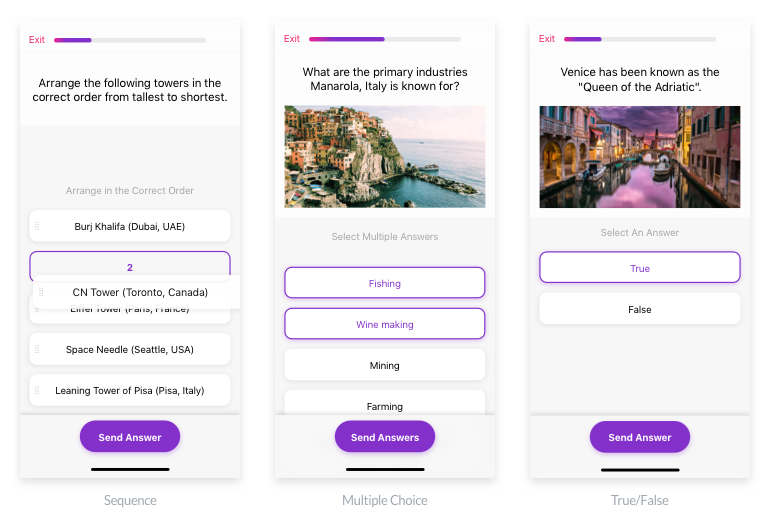 You'll see a variety of different ways you can answer questions in a quiz, for example, as well as choosing the correct answer in multiple-choice you could swipe for true/false or drag and drop the options into a sequence. Some Quizzes will have pass marks. This requires you to answer the specified number of questions correctly to pass. The required pass mark can be seen on the Quiz Summary screen before you start the quiz. Some quizzes can be attempted more than once. Allowing you to retake a quiz to achieve a pass mark. The number of attempts allocated to a quiz can be seen on the Quiz Summary screen before you start the quiz. Retake quizzes with multiple attempts by tapping Quizzes - Results then find the name of the quiz and tap on it, then tap Retake. Or simply retake the quiz right after you have completed it by tapping retake. Questions can have more than one correct answer which should be stated in the question. You may receive feedback on your answer attempt, which appears below your selected answer after it's been submitted.